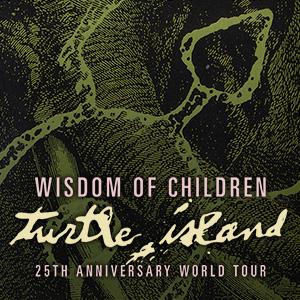 Wisdom of Children (Brian Grunert, Patrick Heyden, Guillermo Izquierdo) is excited to be celebrating the 25th anniversary of the release of their award-winning CD “Turtle Island”. For the first time since its debut, the power trio will perform all of the tracks on the album in order. Joining Wisdom of Children for this historic night is The Corrections and Bread Gone Wry. As many of you know, these are the bands that Guillermo founded after Wisdom of Children imploded following weeks of frustrations, and yep, you guessed it… creative differences. The Corrections, Guillermo’s current band also features Michael Swain, Mark Ricci, and Cave Wilson. Word on the street is that Guillermo’s daughter, Elena, may be also be on stage with them. Opening the show will be another reunion of friends: Tara Gabel and (once again) Guillermo of Bread Gone Wry. Although they will be mostly performing their songs as a duo, you can expect at least a couple of guest performers. In summary, this is pretty much Guillermopalooza. But it’s a fair bet that Heyden and Grunert will be shirtless before the show’s over. So get ready to WOC. Show starts at 9PM sharp. Tickets $10.